His idea revolutionised the toy market and put smiles on children’s faces all around the world. PLAYMOBIL head Horst Brandstätter died on 3 June 2015 at the age of 81 years. Children knew him as ‘Mr Playmobil’, but to most of his employees he was simply ‘HOB’. Right to the end, when he was at home in Zirndorf in Bavaria, Horst Brandstätter came into the office every day. His company – geobra Brandstätter Stiftung & Co. KG, manufacturer of the toy classic PLAYMOBIL – was his passion and his life’s work. He entered the family business in 1952, aged 19, and trained as a mould maker. His two uncles were managing the company at the time. It was not long until he realised that the machines and working methods were out of date. He was only 21 when, as a joint shareholder, he therefore began to promote innovation within the company. Brandstätter’s aversion to the backward-looking phrase: “We’ve always done it that way” also dates back to that time. The tireless company boss had no time for such thinking, being convinced that a company and its employees must keep growing in order to be equipped for future challenges. His visionary ideas and his courage for reform soon resulted in significant economic success for the Brandstätter Company: in 1958 the production of hula hoops became a sales hit throughout Europe. During the oil crisis of the early 1970s Brandstätter, who always trusted his gut feeling, again put his entrepreneurial skills to the test. He requested his master mould maker Hans Beck (1929 – 2009) to develop a completely new toy system which could be continually expanded. His specification was to achieve the maximum amount of play value for the minimum amount of plastic. With the help of PLAYMOBIL, Brandstätter’s company – of which he was by now the sole owner – went on to become Germany’s top-selling toy manufacturer. Most recently, in 2014, the worldwide sales of the Brandstätter Group amounted to EUR 595 million. Proof of Brandstätter’s talent for looking ahead and making his visions become reality can also be seen in the LECHUZA brand, which he successfully established in 2000 as the second pillar of his company. Under this brand name geobra Brandstätter develops and produces not only premium plastic planters with soil watering systems, but also quality garden furniture ‘Made in Germany’. As a typical “down-to-earth Franconian” – as Brandstätter liked to describe himself – he has always been loyal to his roots, but he nonetheless spent 20 winters in his house on Jupiter Island in Florida, so that he could pursue his sporting passion of golf all year round. This also gave his managers and employees an opportunity to manage the company on their own, without the captain being a constant presence. Brandstätter explained his strategy: “When the captain is the only one who knows where the compass is, and he falls overboard – then the ship is doomed. If I am not there, my employees will have to reach their own decisions”. Until the end the 81-year-old had no time to waste thinking about retirement: Instead he put all his efforts into considering what should happen to his life’s work – his company and its more than 4,000 employees worldwide – after his death. With Horst Brandstätter, the PLAYMOBIL family has not only lost its leader, proprietor and patriarch, but Germany’s toy industry has also lost one of its most distinguished personalities. Brandstätter was always thrifty but by no means tight-fisted when important company investments were involved. In May 2013 he proudly broke ground on the new PLAYMOBIL Logistics Centre in Herrieden – an investment of EUR 80 million. Until the end of his life he was resolute and far-sighted, but never shied away from making unconventional decisions. When almost all the toy industry moved production to the low-wage economies of Asia, he opted for a collaborative production network in Europe. The largest facility is situated in Dietenhofen in Bavaria, with other manufacturing sites in Malta, the Czech Republic and Spain. Aware of the need to remain competitive, Brandstätter was nonetheless adamant about retaining control over the quality and safety of his products. Throughout the years he has always been a reliable anchor for consumers, trading partners and employees alike. On the one hand he was an old-school boss, and on the other open-minded and determined to promote and draw out the potential of all his employees – whether old or young, man or woman. To the end. With his life’s work Horst Brandstätter leaves behind a success story which will hopefully endure. His 4,170 staff members worldwide and his management team will continue to navigate his ship as a corporate foundation, so that PLAYMOBIL keeps on bringing smiles to children’s faces all around the globe. 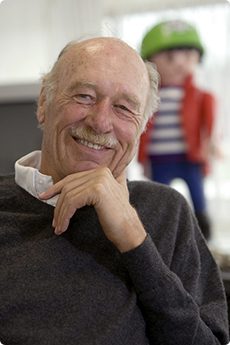 Horst Brandstätter, born on 27 June 1933, was the sole owner of geobra Brandstätter Stiftung & Co. KG in Zirndorf in Bavaria, manufacturer of the toy classic PLAYMOBIL. He was one of the most distinguished personalities of Germany’s toy industry. The success of his more than 60-year entrepreneurial commitment was mainly due to his ability to identify future economic and social developments and to set the path of his company accordingly. As early as the 1950s he realised that the future of toy manufacturing was no longer in metal products but in plastic, and he restructured the entire facility of the family company. In the early 1970s Horst Brandstätter requested his master mould-maker Hans Beck (1929 – 2009) to develop an entirely new toy system: PLAYMOBIL was born. In 1993 Brandstätter was awarded the Cross of Merit on Ribbon of the Federal Republic of Germany for his exceptional achievements and social commitment. He has been an honorary citizen of his hometown of Zirndorf since 1997. The German Corporate Consultant Organization named him “Manager of the Year” in 1999. In 2003 he received the Bavarian Order of Merit, in 2008 the Cross of Merit First Class of the Federal Republic of Germany, and he became an honorary citizen of Dietenhofen, the location of the largest PLAYMOBIL production facility, in 2013. He also achieved international recognition: The North American Toy Industry Association inducted him into its Hall of Fame in 2014 – the first ever German toy manufacturer. Horst Brandstätter would have celebrated his 82nd birthday on 27 June 2015.